...... an option to fill in the new Myspace 'note' to GREATLY increase your chances of being added. 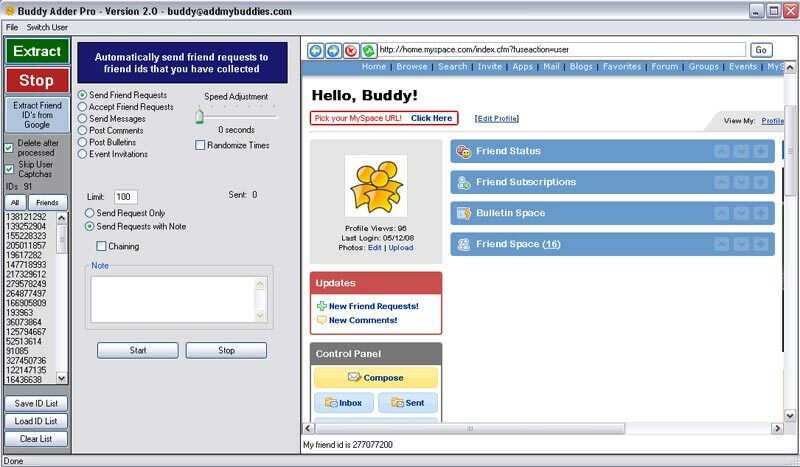 'Speed Adjustment', which allows you to send realistically timed Friend Requests, Messages, Comments, with an option to randomize time delay. Skip User Generated Captchas, GREATLY reducing the number of Captchas you have to manually enter. Chain Multiple Accounts, performing the same actions on all your accounts (Unlimited version only). Automatically Accept Friend Requests, with the option to Leave a Comment or Send a message after accepting. Automatically Send Messages, with the option to send to only your current friends or the full extracted ID list. Automatically Post Comments, with the option for both HTML and non-HTML Comments. Automatically Post Bulletins, with options of # of times to post the bulletin and delay between posts. Qweas is providing links to Buddy Adder Pro 2.0.10 as a courtesy, and makes no representations regarding Buddy Adder Pro or any other applications or any information related thereto. Any questions, complaints or claims regarding this application Buddy Adder Pro 2.0.10 must be directed to the appropriate software vendor. You may click the publisher link of Buddy Adder Pro on the top of this page to get more details about the vendor.